The end of the year is time for introspection and planning. What kind of clients should you focus on in 2019? And how can you find the right opportunities? Read on to find out. It’s that time of the year again when you dust off the client roster and take stock of your relationships. Did you deliver on promises made through the year? Did you meet your year-end targets? Or did you miss a few tricks in the afterglow of a long summer? While you’re busy reviewing relationships, your clients, too, are analyzing their arrangements. They’re revisiting old partnerships, plotting their performance, and charting course for the year ahead. This makes it the perfect time to map your game plan for the next year. Clients who are unhappy about their existing arrangements will be looking for new partners. And your agency would have fresh resources to commit to new relationships in the coming year. So what kind of clients should you pursue in 2019? And what should be your game plan to approach them? I’ll answer these questions and help you plot a path for success in 2019 and beyond. In an earlier article, we talked about the importance of developing an opportunity timeline. To summarize, your sales efforts should be proactive, not reactive. Instead of jumping from lead to lead, have separate plans for short and long-term opportunities. This piece of advice is particularly important when you’re planning your new business approach for 2019. Some of your clients will require a high-touch sales approach. Others will need targeted, timely solutions. Having separate short and long-term pipelines means you can accommodate all these opportunities. The best kind of leads are the ones that already know you. Past clients: At the very top of this hierarchy are clients you’ve worked with in the past. Maybe the relationship didn’t pan out earlier or maybe you separated amicably. In either case, the end of the year is a good time to revisit old clients and see if you can win them back. Cold leads: Next are all once warm leads that have now gone cold. You might not have been able to make that sale six months ago, but the new year is a new time. Reach out to them again and maybe you’ll snag the deal this around. Subscribers and followers: The third kind of leads are people who are already on your email list in some way. Maybe they’re blog subscribers. Or maybe they’ve given up for their emails in exchange for some content. Regardless, these are people who know your brand. Reach out to them and check if they have some need. Website visitors: The last on this list are people that are dropping by your site. Thanks to business intelligence tools, you can get actual names of companies individual visitors are associated with. Since these people have already browsed through your site, they might be interested in doing business with you as well. 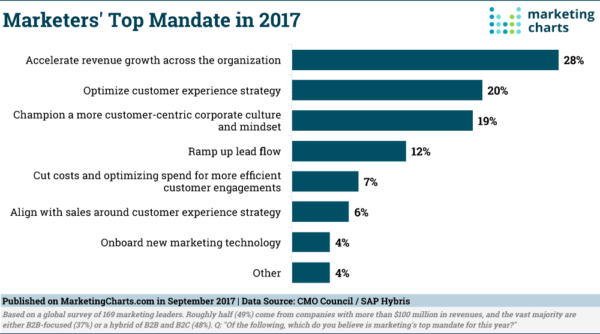 Approach these businesses with a focus on solving their needs for the next year. Ask them about their growth targets for 2019 and how they plan to go about accomplishing them. If any of these pre-warmed leads aren’t happy with their current agency partners, you might just get a toe through the door. Except for the last bit (website visitors), spotting these opportunities is easy – they live right in your inbox. Clients you’ve worked with in the past. Reach out to them in this order. For extracting company information from website visitors, use tools like LeadFeeder. 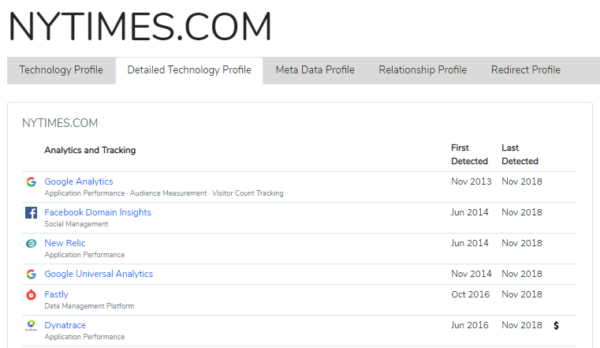 This will show you which companies visited your site and what pages they browsed through. If you see a business spending a lot of time on sales-focused pages such as case studies or pricing, it might be a good idea to send them an email. Do you know a business that can’t get people to share its content or rank in the SERPs no matter how hard it tries? If yes, this business might be ripe for a new agency partnership. Poor results, especially in a highly visible area (such as a poorly performing website, limited search visibility, etc. ), can indicate that the business’ agency partner is under-performing. When this business reviews its contracts at the end of the year, it might be willing to listen to overtures from competing agencies. The key to targeting these clients is to focus on quick fixes that can deliver immediate returns. Remember that marketers are increasingly responsible for P&L. At the end of the year, they’re often desperate for anything that will bump the bottom line. An agency that can promise them a quick increase in their KPIs can at least get a meeting. Since your goal is to offer quick fixes, start by targeting industries where you already have substantial experience in. Next, look up companies similar to your existing clients in these industries. Try to spot under-performing businesses, especially in your area of expertise. An SEO agency with successful SaaS clients, for instance, can look for similar SaaS businesses with poor search engine visibility. A social media agency can look for businesses with poor engagement on their social profiles, etc. Once you find a few such businesses, reach out to them. A business with a new product in the market would also have a budget to support its marketing. For agencies, this is a golden opportunity to get a meeting, especially if the product is in an area you have prior experience in. The problem, however, is that product launch roadmaps are planned years in advance. The business might have an agency partner in place months before they even have a working prototype. To get a look in, you have to be involved during the early stages of the development cycle. The exception to this rule is when a business launches a new product on a hyper-accelerated plan. If there is competitive pressure or an urgent market need, the business might rush through the development process. In such situations, an agency with prior go-to-market expertise can often get a look in before existing agency partners. Like under-performing businesses, spotting businesses on an accelerated launch path can be difficult. You have to understand your target industry thoroughly. It’s also helpful to have prior experience in product launches to win over clients. Analyze industry players: Make a list of major players in your target industry and their offerings. Is there a business that’s clearly behind others in terms of product selection? Have there been murmurs from the leadership about launching new products? Review user forums: Head over to industry forums and social media. Look for complaints from the business’ existing customers about product selection. If a lot of people are demanding it, there is a good chance the business would plan a launch. Understand launch cycles: Companies usually plan their launches to coincide with peak market demand. For instance, a sports company would launch its new products in summer. Development of these products might start the year before. Study development timelines in your industry to estimate when a business might launch a new offering. Do you know a business that’s publicly made a commitment to a new technology? Or perhaps everyone in the industry is jumping onto the new technology, leaving your target business behind? Businesses in this situation should be your prime targets, especially if you have expertise in their target technology. If they’ve already made a commitment to their customers, they’re also likely on the lookout for partners to help them execute. A well-timed offer can help you close some very lucrative deals this way. For a business to adopt new a technology, there has to be sustained pressure – either from the market or internal stakeholders. While you can’t really get an inside view of what the stakeholders are thinking, you can study the industry and spot trends. For instance, if 50% of the big players in an industry have adopted AI/ML, the remaining few would likely follow suit too. If nothing else, the pressure to keep up with the Joneses Inc. would force them on an accelerated adoption path. Another sign of new tech adoption is a small, technologically advanced player eating up a slower competitor’s market share. If you know a business that’s hemorrhaging customers this way, sweep in with a pitch. They’re likely looking for some ideas. In certain cases (such as web design), tools like BuiltWith can also help you spot outdated technologies. If you see a business with poor performance and outdated tech, swing in with a pitch. A business acquiring, or being acquired by another offers both these conditions. When a business sells/buys another, it usually means that they’re going to be cleaning house. Old vendor relationships will be scrutinized and there might be personnel changes. But that’s not all. Companies that recently acquired/were acquired often feel the need to make a bold move to inspire the troops and keep up morale. New products, hires, and vendor relationships are the usual go-to solutions. In such cases, a well-timed pitch can get you in. Practice discretion: Businesses like to keep M&A news on the hush, lest it spook the market or impact morale. If you’re going to chase such deals, make sure that you promise (and practice) absolute discretion. Win with big ideas: A merger/acquisition is not the time for small thinking. If you’re going to win them over, offer big, impactful ideas – something the press can tout as a “new CEO” move. Focus on costs: Resources are stretched and expenses are scrutinized heavily following an acquisition (especially at the company being acquired). By focusing your solutions on cost savings, you can give stakeholders exactly what they want: lower expenses. Spotting M&A rumors before they hit the press is hard. Your best bet is to monitor industry-focused blogs and websites like Crunchbase that track acquisitions. Another great site is Reuters’ mergers and acquisitions news feed. However, it can get overwhelming quickly since it tracks deals across industries and geographies. Once you do find an opportunity, act quickly. Pitch attention-grabbing ideas that solve a key issue in the merger/acquisition. Say, if the business was sold because it had poor media visibility, pitch a PR campaign. As far as agency new business goes, change is good news. And there are few changes better than a new round of funding. Businesses don’t raise money to keep doing things the same way. They raise it to implement new projects and pursue new opportunities. Recently funded businesses are typically in hyper-growth phase. While they might already have agency partners, not all of them will be experienced in accelerating growth. Make such businesses your top targets; they’ve got the money and the need to do something substantial with it. Focus on big ideas: A business that’s raised substantial funding wants accelerated growth, not to plod along at 10% YoY. Pitch “moonshot” ideas that can get them that vaunted “hockey stick” growth curve. Focus on ignored areas: Businesses often ignore growth areas that require substantial, long-term investment (such as SEO). With a new round of funding, however, they might have the money and more crucially, the time to pursue such opportunities. The last thing you want is to offer middle-of-the-road solutions to a company looking for accelerated growth. Either pitch big ideas or offer to take care of parts of their business they’ve long ignored. Crunchbase doesn’t track every deal, of course. You’ll also want to keep an eye on industry blogs or region-specific news outlets. A change in key personnel is always a good time to pursue new leads. After all, the first order of business for many executives is to review existing partnerships and make a few moves to improve morale. But a shift in management around the end of the year is particularly good for you. Executives coming in around this time need a big win to end the year on a high. If you can deliver that, you can find a seat alongside other agencies. Don’t get too greedy pursuing these leads. The business likely already has plenty of other agency partners. Don’t try to supplant them. Instead, complement their competencies, but offer something they can’t accomplish. Focus on quick wins – anything that makes the new decision maker look good. Your goal should be to leverage these small wins into a juicier contract the next year. The best way to spot these opportunities is a strong LinkedIn network. LinkedIn sends you alerts if any of your connections have started new jobs recently. Keep an eye on these alerts and make a mental note of people who’ve moved to new companies. 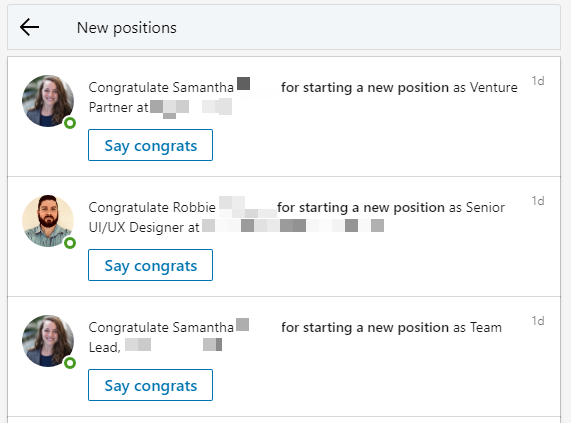 LinkedIn new job notifications are a good way to spot opportunities within your network. If they’re in a leadership role, congratulate them on the move. Then gently ask what challenges they’re facing and if there is anything you can do to help them. Another tactic is to look at industry blogs. Key personnel changes are often covered in niche blogs. AdAge, for instance, keeps tabs on key hires and departures in the advertising industry. When you spot these opportunities, focus on helping, not selling. Any new exec has a lot of responsibilities; the last thing he wants to hear is a cold pitch. The end of the year is a great time to pull in new business. Clients review their performance, take stock of budgets, and create plans for the coming year. Targeting the right opportunities and sending the right pitch can help you get a look in. These 7 client-types I shared above should be your top priorities for the coming few months. Businesses that are changing key personnel, developing new products, or implementing new technologies often need fresh ideas. If your agency can offer a new perspective, you’ll at least get a meeting, if not a deal.